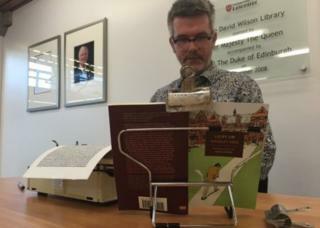 An artist has started retyping a celebrated novel by Kingsley Amis on a single sheet of paper, at the university that inspired the book. Tim Youd is typing Lucky Jim at the University of Leicester using an Adler Universal, the same model of typewriter used by Amis to write the book. Youd aims to retype 100 classic novels in a series of performances at places relevant to the author or novel. He will be at the university's David Wilson Library from 7 to 14 March. "I'm retyping 100 novels over a multi-year period as a devotional performance, to really rededicate myself to each and every one of the novels and the text in the novel," said Youd. He is now into the third year of the project and this is the 32nd novel he has typed. "The novel has to have been written on a typewriter in some way, so that kind of defines the overarching length of the project," he said. "I could pick from about the 1890s up to the 1980s, with a few exceptions. A few writers still write on typewriters but not too many." The poet Philip Larkin, who was friends with Kingsley Amis, was an assistant librarian at University College, Leicester, which is now the University of Leicester. Visiting his friend there gave Amis the idea to write Lucky Jim, his first novel, about a young university lecturer called James Dixon. Larkin had a relationship with a lecturer called Monica Jones, and she is said to have been the model for a female lecturer in the book. For his Typewriter Series, Youd repeatedly runs the paper through the typewriter until every word of the novel has been retyped. The paper is backed by an additional sheet of paper, and both pages are later mounted, representing two pages of an open book. While in the UK Youd will also be retyping Anthony Burgess's A Clockwork Orange at Manchester Central Library, and two novels by Virginia Woolf, To the Lighthouse and Orlando, in Cornwall and Sussex.